To say that this was just another year for Auburn-themed food is to say that what happened downtown last Monday night was just another rolling. To wit: this unbelievable Auburn groom’s cake. Our only complaint? It’s just not realistic… unless the War Eagle wedding went down before the national championship and this to be the way Toomer’s looks now, a week after the celebration. UPDATE: We are thinking of purchasing the domain www.AuburnGroomsCakes.com. This cake from Chris Delvizis would definitely be on the homepage. 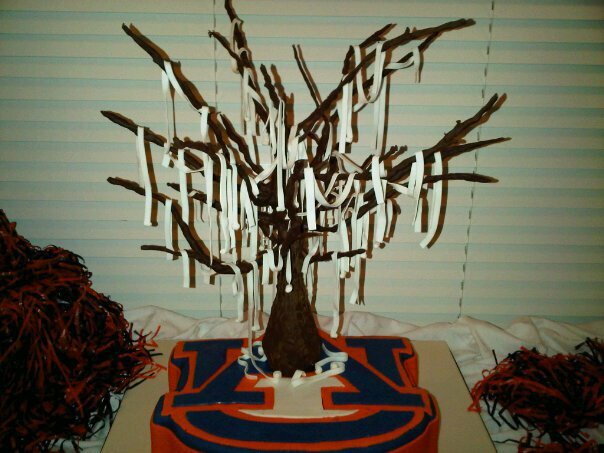 We expect photos of three more Auburn groom’s cakes by morning. Yes, that does appear to be video of Tommy Tuberville being interviewed playing on the jumbotron. In icing. 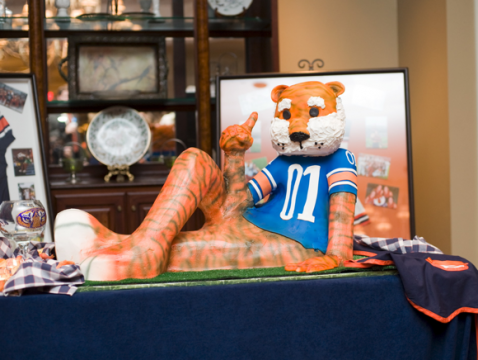 The groom in this case was Mike Parson’s, but the photos were submitted by Matthew Hinshaw, Parson’s groomsman… along with, yes, Chris Delvizis, of the Aubie groomsman cake Delvizis’. “A lot of great Auburn grooms’ cakes in my circle of friends,” writes Hinshaw. And we’re sure there are more. 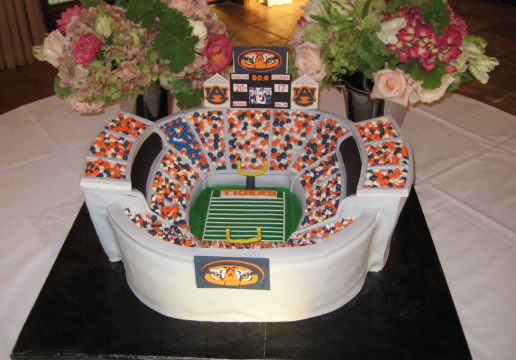 We’ve obviously uncovered and tapped into a thriving subculture of Auburn’s grooms cake enthusiasts. And we’re all about that. So please —keep’em coming. We are now absolutely certain that you will. 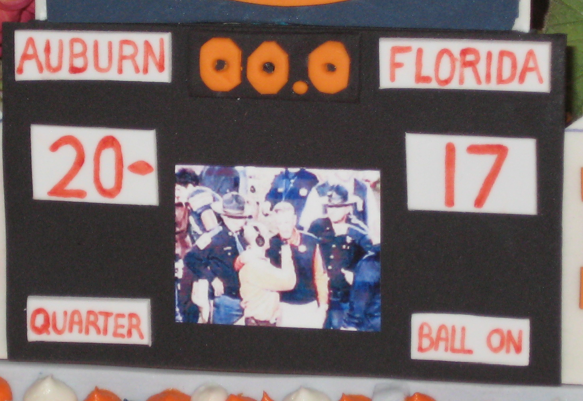 The Toomer’s Groom’s cake was for my buddy, Ryan Jones. It went down this past weekend (Jan. 15th). 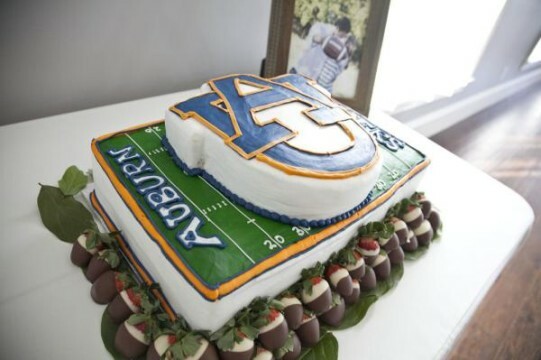 Backstory: Ryan only asked for an Auburn cake, with the AU logo. The decorator came back and asked if he could have a little fun with it. Ryan agreed so the decorator scoured the interwebs for pictures of Auburn and the Toomer tree rolling caught his attention and became glorified in sugary confectionery goodness. For someone new to the game that is rolling Toomer’s, I give the decorator huge props for doing a fantastic job. By the way, the tree was saved and will live with the Groom until it’s crushed by it’s own awesomeness. Oh no, it’s awesome. Just a comment on the amount of toilet paper last week. And yes, it should be saved. Do yall have the names of the cake decorators for these? Would love to know who made them! I have a friend whose groom’s cake was of Bryant-Denny. I know, I know. But it looked pretty good, being a cake and all. The baker, though, only gave it to them when they agreed they would NEVER tell anyone who made it. She didn’t want any part of another stadium cake. I thought the matching, life-sized hollow chocolate football was a nice touch. The decorative houndstooth cap was a bit much, however. My cake decorator told me that they could not do the official AU logo on my grooms cake (due to copyright issues), so I settled for just an orange semi-interlocking A and U. I wonder if the decorator just wasn’t quite up to the challenge. My husband and I are the cake people that did the cake for Katie & Ryan Jones. Katie (the bride) had shown us some pictures of the tree, decorated after an Auburn win. It was supposed to go on a previois design we were going to make for the grooms cake…….since the tree meant so much to her, we really wanted to incorporate it into the cake. Glad everyone enjoyed it so much!